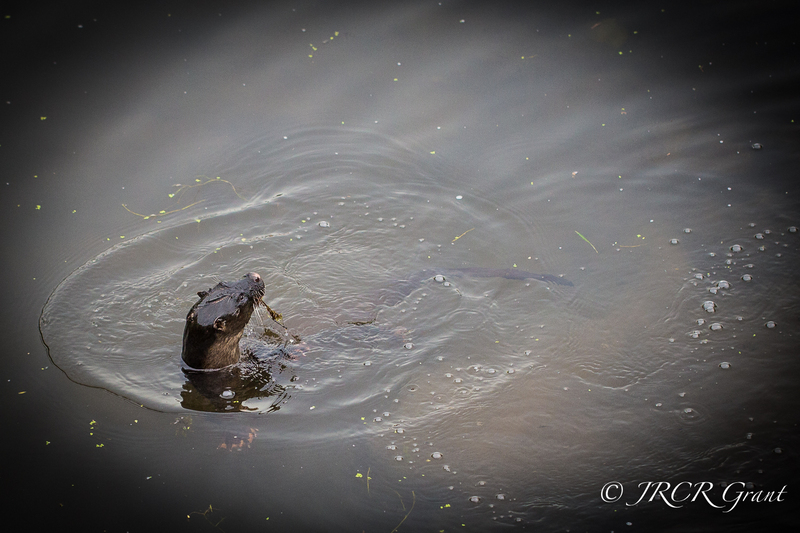 Ever since tales of Tarka the Otter and Ring of Brightwater, I have always wanted to see an otter in the wild. Now I’ve seen these wonderful creatures in zoos and conservation centres – most notably in Tamar, Cornwall where they featured in a post last year entitled ‘Tamar Otter Gallery’ – but this just isn’t the same as seeing them in the wild. On Skye, Mull and by Applecross I went in search of these elusive animals and no confirmed sighting could be claimed. So off to take the Hound for a walk on Sunday morning I did the usual peer over the bridge to see if the resident kingfisher was at his post. No sign of the turquoise jewelled fancy but I still went along a few more yards to look down into the main stream. My jaw dropped. Below me in the shallow water and reeds frolicked not one, but two otters. I was enchanted and just stood watching them awhile. Needless to say as soon as I reached for the lens cap, I was spotted and with a couple of shrill warning cries the games finished and the otters swam to the safety of the holt. Returning to the scene a little later I was able to fire off a few shots, albeit I only had my 100mm with me. Needless to say the image below was heavily cropped, but here is the proof of my major excitement and a reduction in my bucket list by one! The beauty of nature – you can even see his pink paws just below the surface of the water. I’d say so. saw a Platypus at the Aussie wildlife centre in the harbour at Sydney and just loved their movement – very mush otter like. Have you seen the platypus in the wild? Sadly, no I haven’t Mick. I know of a place about 15kms out of town where a lady I worked with used to see them quite regularly but each time I have been there I’ve had no luck. When you least expect it …. In my younger days I spent a lot of time in the woods; either hunting or just enjoying nature. I have come across otters several times. And I was not hunting them. I have never seen another animal in the wild that enjoyed playing so much. It is pure fun to watch them. Well done John, but what did Harry do? Fantastic shot John. I loved Tarka too, and had a similar experience years ago, unexpectedly being able to watch several otters frolicking about on my local river for about an hour. Didn’t have a camera, but it was a great experience. Brilliant post! Otters are so lovely to watch in the wild! If you are ever wanting to get up close and personal head to Alaska, Homer to be exact. There are kayak tours that take you to some beautiful landscape and everywhere you turn there are otters! They swim right along with you, eat their latest catch while studying you. They play with the small wake of your boat, it is an incredible experience. They are amazing creatures to say the least. What a treat to get to see one and good luck “capturing” another. Alaska is on the list of places to go. Homer. Thank you for the info, hopefully…. I lived in Alaska for 6 years, enjoyed so many wild things there! The drive from Homer to Anchorage is about 6 hours, incredibly beautiful. Worth the drive, effort to make it to Homer. I would think you could also see lots of otters in Seward too. That is only a 2-3 hr drive from Anchorage and great opportunities to view wildlife. Hope you make it there at some point. Good luck getting more images of those otters. What a great image! I would love to see an otter in nature, lucky you! Wonderful, John. I can share your excitement over this one, as things like this happen when you least expect it and the camera isn’t ready nor are you. But a great crop and I think he/she looks just fine. I did the same thing with a platypus a native of Australia and had my 100mm on as well 😦 I too have read Ring of Bright Water a magical story of a bygone era. OMG how exciting. I adored Tarka the Otter when I read as a child (I bought a copy a few years ago) and found the Ring of Bright water books as an adult in the city library. I want to be reincarnated as an otter and would LOVE to see a wild one, deeply envious of your luck. Look forward to the pix!